What is the difference between thick and thin skin? The terms thick and thin refer to the thickness of the epidermis. Most of the body is covered by thin skin, which is 0.003 inches (0.08 millimeters) thick. 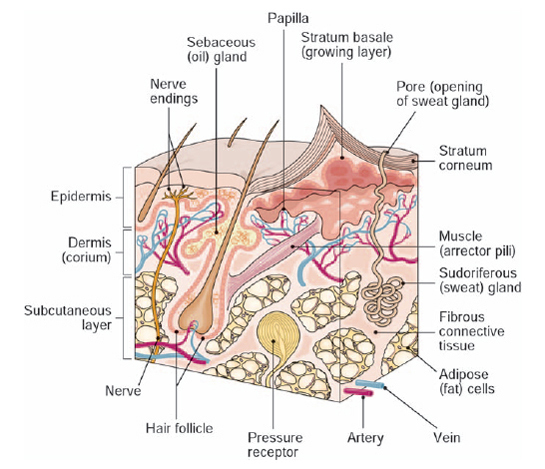 This skin contains hair follicles, sebaceous glands, and arrector pili muscles. The epidermis in thick skin may be six times thicker than the epidermis that covers the general body surface. Thick skin does not have hair, smooth muscles, or sebaceous glands. Thick skin on the palms of the hands, the fingertips, and soles of the feet may be covered by many layers of keratinized cells that have cornified.